Are your ready for some Dive Safaris Adventure? Join our Dive Safaris in the Philippines and experience a new way to explore multiple dive sites around the country. On board one of Fun & Sun’s comfortable banca boats, you will be part of a Diving Expedition to some, most often, remote location in the Philippines. The nights can be spent on land, in selected resorts or even on the beach or on our boat for the real adventurers (that is if you would like to experience camping at sea). With a compressor on board, we will have the flexibility to dive anytime and anywhere. With dive guides that have excellent knowledge of the dive sites, we will dive in locations we ourselves have never visited before. This is what we call our Exploration Dives. 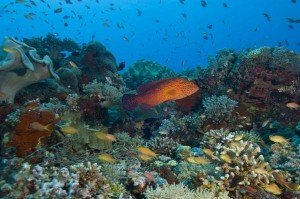 The duration of a dive safari in the Philippines ranges between 4 to 10 days and depends on sea conditions and guests’ desire. Departing from Mactan, the first dive site will be Capitancillo Islet, off the town of Bogo, before proceeding to Malapascua Island. Next destination will be Camotes Island, with a stop in Kalanggaman along the ways. 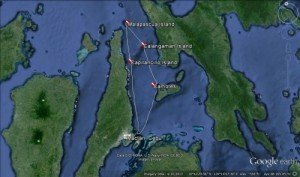 Cuatro Islas might be visited before heading back to Mactan. 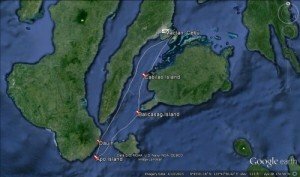 This route will bring you to Sogod Bay where you will discover some really remote dive sites. Between the month of October and April, there are also frequent sightings of whale sharks. Don’t forget to check out Limasawa Island, where the first Mass was held back in 1521. There are several world class dives sites on that route starting with Cabilao Island. Next leg will bring you to Balicasag Island before heading to Dauin and Apo Island area. You will enjoy the Fantastic mix of marine life including stunning critters on such route in this Dive Safari. Expect the unexpected on this route in the Philippines, starting with the opportunities to encounter wild dugongs in the northern part of Busuanga after you have visited some really nice wreck in Coron area. Do paddle around the mangrove and experience something radically different in the crystal waters of Apo Reef. Sharks patrolling the reef are always providing great memories. Of course, the different routes can be combined together! With our Safaris, you can enjoy the combined comfort of the safari boats and resorts. No repacking of equipment between the transfers from one destination to the other. Your equipments will stay the whole time on your assigned boat. Enjoy the comfort of a big room, spa services and relax along the beaches after a day of diving in our selected resorts. Looking for something individual for your Dive Club, Group, Team, Friends? Want to have an all inclusive package? Want to enjoy the luxury of a resort and spending your days diving?